Imagine this scenario: You’re at a party and don’t know anyone. You grab the nearest glass of wine and gulp it down. Suddenly, approaching that interesting man at the bar doesn’t seem so daunting. Is it really liquid courage? Yes, according to a new study from researchers at the University of Illinois at Chicago College of Medicine. 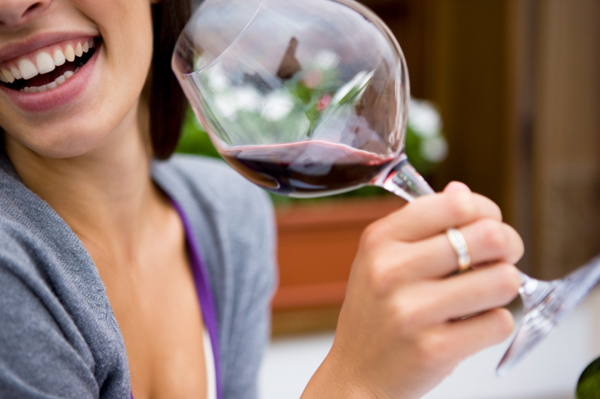 The researchers found that even one glass of wine is enough to interrupt communication between the amygdala and parts of the prefrontal cortex. This “breakdown of communication” might explain why our inhibitions go down after imbibing a few cocktails. “How the amygdala and prefrontal cortex interact enables us to accurately appraise our environment and modulate our reactions to it,” said Dr. Luan Phan, a professor of psychiatry at UIC. In the study, researchers evaluated 12 heavy social drinkers — two women and 10 men with an average age of 23 — and gave them an alcoholic beverage (at 16 percent alcohol, or a strong glass of wine) or a placebo. The participants were then shown a series of pictures of faces while researchers did a functional MRI scan. The researchers tracked the brain activity of the subjects as they tried to express the same emotions as the subjects in the pictures — happy, angry, fearful or neutral. The researchers found that subjects who drank the alcohol “exhibited reduced connectivity between the amygdala and the orbitofrontal cortex.” They also noticed that those who drank the alcohol were unable to distinguish between the different emotions expressed in the pictures. “This suggests that during acute alcohol intoxication, emotional cues that signal threat are not being processed in the brain normally because the amygdala is not responding as it should be,” Dr. Phan said. Basically, it means your mouth isn’t to blame when you say something stupid after a couple of drinks — it’s your brain.